Ooma in some rooms, landline in others? I've tried searching all over, but can't find a solution for my problem. What I want to do is have Ooma set up in certain rooms in my house, and have the rest of the rooms on a landline. I've got my Ooma Hub hooked up in the office where I've got my cable modem, and I want to connect it to the phone jack there so that I can get the Ooma dialtone in the kitchen and 2 other rooms using one of the unused CAT5 wires (I'm thinking the brown/white-brown ones, for Line 4) running throughout the house. (I don't want to use the scout)... I have a landline set up on Line1 (the blue/white-blue CAT5 wires), which I want to keep connected through the rest of the house, for business reasons. Is this possible for me to do myself? I'd REALLY appreciate it if someone could walk me through the process. Thanks in advance! Re: Ooma in some rooms, landline in others? My assumption is that all your walljacks are wired for the blue pair and therefore get the landline? If so, go to the NIB and make sure that only blue pair is connected to the telephone company. L1 is where the landline is and L2 is where you distribute and access ooma dialtone. Thanks for the quick reply! Yes, right now all of them are set to L1 (blue/the landline). So if I pick up a few of these, I should be all set then? Do I need them everywhere, or just where I want the Ooma dialtone (L2)? Also, will this avoid that interference from the phone company landline that could cause damage to the equipment? ddd5 wrote: Thanks for the quick reply! Yes, right now all of them are set to L1 (blue/the landline). So if I pick up a few of these, I should be all set then? Do I need them everywhere, or just where I want the Ooma dialtone (L2)? Also, will this avoid that interference from the phone company landline that could cause damage to the equipment? You'd just need these splitters where you want to distribute Ooma dialtone and where you want to get Ooma dialtone. In order to avoide damage to your Ooma, you just got to make sure the pair you use (L2) is not connected to the phone company. From what you were saying, one wire bunch's L1 is connected to the other's L2....yet the other's L1 is connected to the phone company. Here's a picture of my NIB. Hopefully its pretty clear to see what is connected where. The orange/white-orange wires aren't connected to anything in the NIB. But in the wall jacks throughout the house, both the blue/white-blue and orange/white-orange wires are connected. The brown & green pairs are not connected anywhere. Given this setup, would it be as simple as plugging in the L1/L2/L1+L2 splitters you mentioned earlier to get this working? Thanks again, I appreciate your help! Edit: Also, as an alternative to getting the splitters, how would simply disconnecting the blue wires from the wall jacks work? I tried this yesterday from 2 wall jacks (the office where I have the Ooma Hub, and the kitchen where I want the Ooma dialtone), and connected the orange wires to where the blue wires were (in the L1 position, I assume), but it didn't seem to work. Edit 2: Okay, this whole time, I thought my house was wired with CAT5 wiring, but I just realized it is actually CAT3 (house is about 15 years old). Dunno if this makes much of a difference to this issue. Just a guess here - you probably either did or do have an alarm system. The "quad" wiring (red/green/black/yellow) goes to an RJ31X jack for your alarm panel. Don't mess with those wires. Just take the two orange/white wires and connect them together and take the two white/orange wires and connect them together. I like using the "beans" like you have where the quad connects to the blue/white pair - but you can purchase "scotchlock" connectors at Lowes or Home Depot. Your idea to just change the wiring at the individual jacks is great. For greater flexibility, while at Lowes or Home Depot, pick up some double wall plates and have both the ooma and land line available where ever you would like. Blue/white is landline, Orange/white is ooma. Don't forget to plug a cable from the ooma PHONE jack into one of the Orange/white jacks. SouthSound's guess is as good as any. So, I suppose the the landline dialtone is going into the L1 of the Quad pair, into the alarm, then out of the alarm via the L2 of the Quad pair (if I am getting what SouthSound is saying correctly), then into the L1 for the whole house (blue pair)? lbmofo wrote: SouthSound's guess is as good as any. So, I suppose the the landline dialtone is going into the L1 of the Quad pair, into the alarm, then out of the alarm via the L2 of the Quad pair (if I am getting what SouthSound is saying correctly), then into the L1 for the whole house (blue pair)? Correct. The alarm panel can seize the line when wired this way. When an alarm panel reports it disconnects all other phone devices so an intruder can't stop the dialing process. When the panel is not in an alarm mode it is sending dial tone through the yellow black pair to the two sets blue/white pairs. 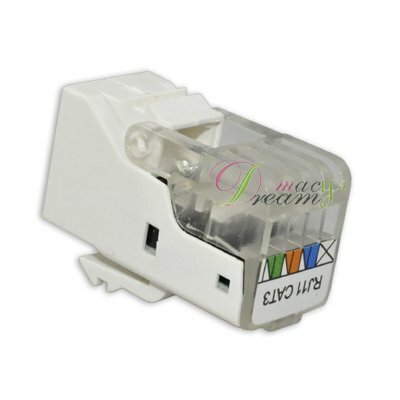 ddd5 wrote: Also, as an alternative to getting the splitters, how would simply disconnecting the blue wires from the wall jacks work? I tried this yesterday from 2 wall jacks (the office where I have the Ooma Hub, and the kitchen where I want the Ooma dialtone), and connected the orange wires to where the blue wires were (in the L1 position, I assume), but it didn't seem to work. The reason this didn't work is because there are two cat-3 cables running through your home. Assuming again, but the jacks you were using were on cables that were not connected. When you join the orange/white wires and the white/orange wires (separately, of course) you are completing the connection between the jacks. southsound wrote: Just a guess here - you probably either did or do have an alarm system. The "quad" wiring (red/green/black/yellow) goes to an RJ31X jack for your alarm panel. Don't mess with those wires. Just take the two orange/white wires and connect them together and take the two white/orange wires and connect them together. I like using the "beans" like you have where the quad connects to the blue/white pair - but you can purchase "scotchlock" connectors at Lowes or Home Depot. Your idea to just change the wiring at the individual jacks is great. For greater flexibility, while at Lowes or Home Depot, pick up some double wall plates and have both the ooma and land line available where ever you would like. Blue/white is landline, Orange/white is ooma. Don't forget to plug a cable from the ooma PHONE jack into one of the Orange/white jacks. Yep, youre right, I've got an alarm system hooked up to the landline. So then I won't touch any of those wires. I will stop by Lowes tomorrow and pick up some of the "bean" connectors, or the scotchlock ones, whichever they have. Thanks for the tip for the double wall plates! That makes sense, so that I can plug a phone into either line in the future without having to mess with the wiring again. So, the only place I will need to connect the orange/white and white/orange wires (separately) is in the NIB, correct? One more thing. The wall jack in my office has 2 sets of wires (just like in the NIB), but the jack in the kitchen has 3 sets of each. Does this make any difference? You both are incredibly helpful. I just hope all this works! 1. So, the only place I will need to connect the orange/white and white/orange wires (separately) is in the NIB, correct? 2. One more thing. The wall jack in my office has 2 sets of wires (just like in the NIB), but the jack in the kitchen has 3 sets of each. Does this make any difference? 1. Yes and no - Yes as to just making the connection at the NIB - for the other jacks, see 2 below. 2 If you discover that the orange/white wire pairs are not connected elsewhere, I would connect them at the plate. No need for beanies or scotchlock connectors if there is a screw available. Just connect all of the orange/white wires under the screw where the red wire is and all of the white/orange wires under the green screw. If your jacks are the newer punch down type jacks, you may still need to usee scotchlock's or beanies to connect the wires plus an extra one to punch down into the jack since these jacks typically accept only one wire per contact.